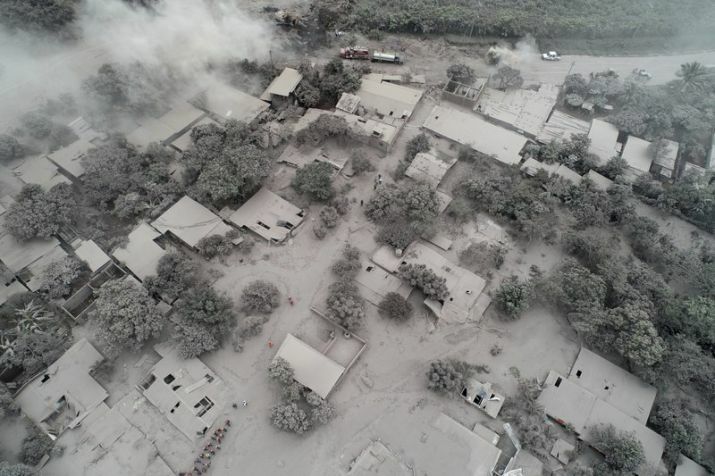 The fiery volcanic eruption on Sunday in south-central Guatemala killed scores as rescuers struggled to reach people where homes and roads were charred and blanketed with ash. Rescue workers search in El Rodeo, one of the hamlets in the disaster area near the Volcan de Fuego, or “Volcano of Fire,” in Escuintla, Guatemala, Tuesday, June 5, 2018. El Rodeo: Lilian Hernandez wept as she spoke the names of aunts, uncles, cousins, her grandmother and two great-grandchildren — 36 family members in all — missing and presumed dead in the explosion of Guatemala’s Volcano of Fire. What was once a collection of verdant canyons, hillsides and farms resembling a moonscape of ash, rock and debris on Tuesday in the aftermath of the fast-moving avalanche of super-heated muck that roared into the tightly knit villages on the mountain’s flanks, devastating entire families. Two days after the eruption, the terrain was still too hot in many places for rescue crews to search for bodies or — increasingly unlikely with each passing day — survivours. 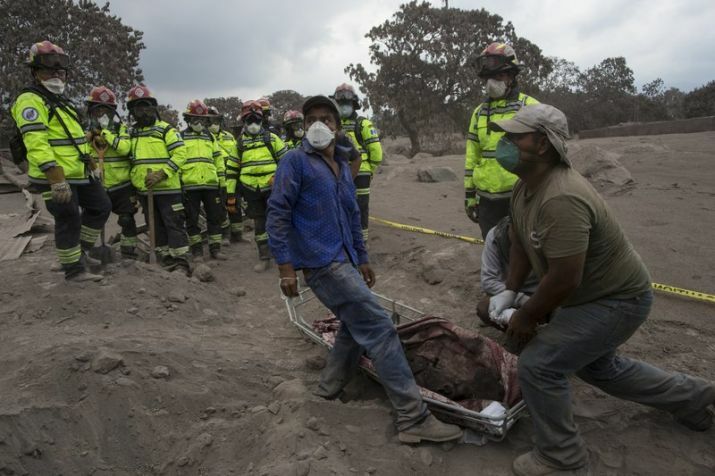 People try to identify the body of a relative who died in the disaster zone near the Volcan de Fuego, or “Volcano of Fire,” in the El Rodeo hamlet of Escuintla. The new evacuation order set off a panic even in areas that were not under it. 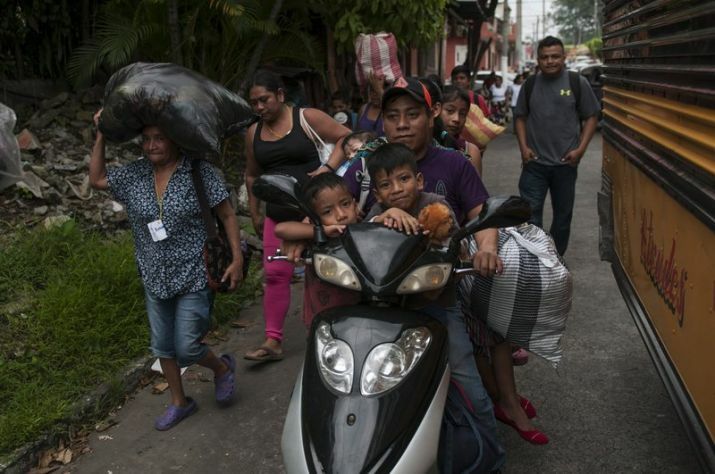 Dozens of people could be seen walking down roadsides carrying children or a few belongings beside paralyzed traffic in parts of Escuintla township south of the volcano. A lucky few, like retiree Pantaleon Garcia, was able to load his grandchildren into the back of a pickup with a jug of water and some food, to go to stay with relatives in another town. Even in more distant central Escuintla, which hosts most of the shelters for those evacuated from other areas, businesses were closed as people left. On Sunday, when the volcano exploded in a massive cloud of ash and molten rock, Hernandez said her brother and sister ran to check on their 70-year-old grandmother on the family’s plot of land in the village of San Miguel Los Lotes. 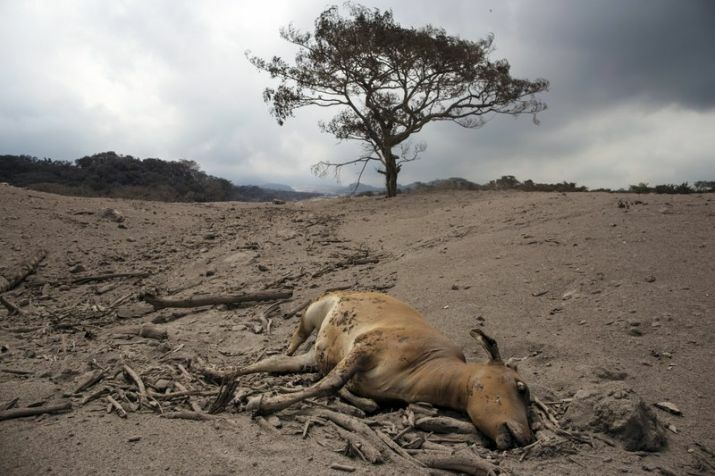 A dead cow lays in the disaster zone near the Volcan de Fuego, or “Volcano of Fire,” in Escuintla. Guatemala’s National Institute of Forensic Sciences raised the death toll Tuesday evening to 75. The institute said that 23 of those recovered bodies had been identified. Sergio Cabanas, director of the disaster agency, said Tuesday night at a news conference that 192 people were listed as missing. He said it was not immediately clear if some of those could be among the unidentified bodies. Officials are crossing-checking census data with aerial photos of homes, registers of people in shelters and lists of the missing and injured, Cabanas said. The only thing they did not yet have was information on the unidentified bodies, but would be adding that as it became available, he said. “We don’t rule out the possibility of some person alive, but the condition in which the homes are makes that possibility pretty unlikely,” said the spokesman, Julio Sanchez, adding that some of the ash was still at temperatures between 750 and 1,300 degrees Fahrenheit (400 and 700 degrees Celsius). Residents evacuates after a new flow of searing hot volcanic material moved down the slopes of the Volcano of Fire in Escuintla. “Animals have a different sort of resistance ... and different behavior when it comes to finding refuge,” Sanchez said. 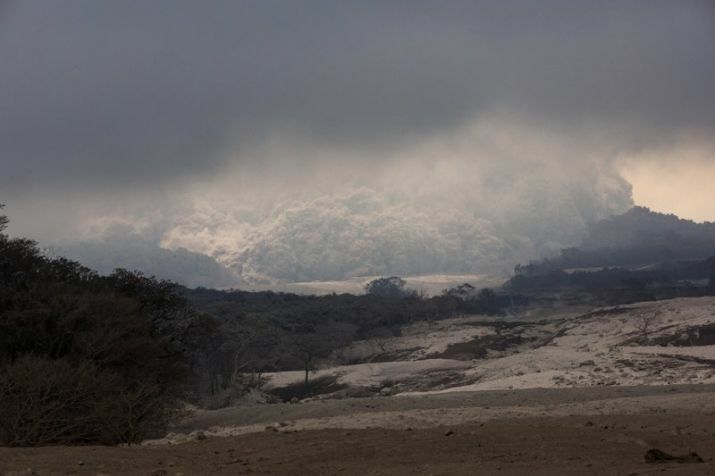 Clouds of ash rise from the Volcano de Fuego Escuintla, Guatemala. As dawn broke Tuesday, the volcano continued to rattle with what Guatemala’s Volcanology Institute said were eight to 10 moderate eruptions per hour — vastly less intense than Sunday’s big blasts.